Better than the Real Deal and Even Better for You! These taste so much like the real thing it is ridiculous! The amount of honey in this recipe makes it very sweet but this is perfectly off-set by the dark chocolate. If however you no longer tolerate such sweet treats, first of all congratulates! And then of course, you could easily put in less honey and adjust the flours for thickness. If you have the time and desire you can get candy molds to make these into look-a-like peanut butter cups. In a large mixing bowl, add the peanut butter and white honey. Liquefy the coconut butter by putting the coconut butter in a small jar and place in hot water and then stir. Add the coconut butter to the mixture and with a spoon, stir together well. 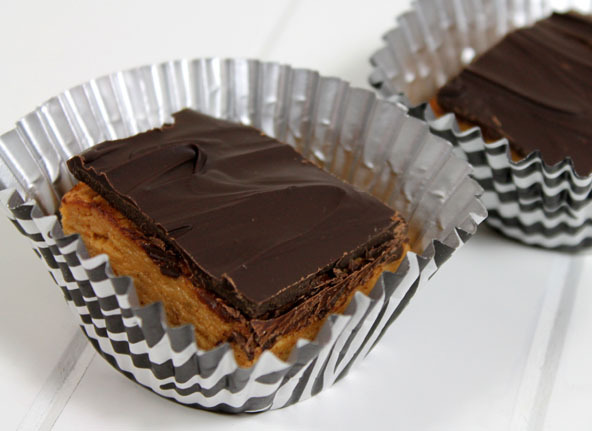 Set the peanut butter filling aside while you melt the chocolate. Place the chocolate in a double boiler over medium heat and melt the chocolate and stir until smooth. Place parchment paper into a 9”x13” pan with the parchment paper sticking out enough to grab and lift the slab of candy out later. 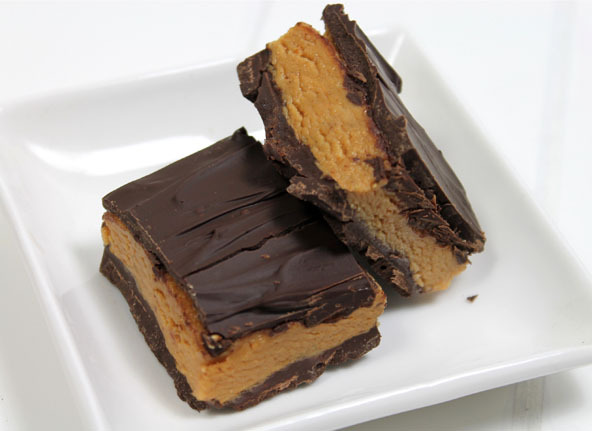 Spread half of the chocolate on top of the parchment paper and spread evenly..
Place the pan in the refrigerator for 15-20 min or until its hard enough to spread the peanut butter filling over it. Once you layer the filling on top, spread the rest of the melted chocolate on top. Place the pan once again in the refrigerator to harden. When its firm and ready, Grab the parchment paper and remove the three layer slab of candy from the pan and on to a cutting board. Cut the candy into desired size and serve. Store refrigerated in an air tight container or wrap individually. They can also be frozen.